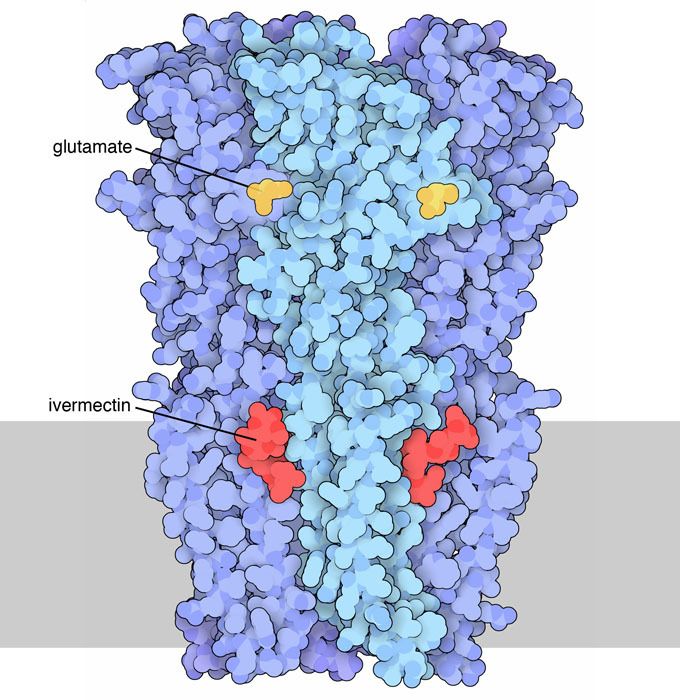 The antibiotic ivermectin attacks glutamate-gated chloride channels, paralyzing parasitic worms. Glutamate-gated chloride receptor from a nematode, with glutamate (yellow) and antiparasitic drug ivermectin (red). The nerve membrane is shown schematically in gray. Medical science is always looking for a magic bullet: an antibiotic that will kill a pathogen, but leave our own bodies untouched. The trick is to find targets that are unique to the pathogen, and then find a drug that attacks only them. For instance, penicillin attacks the machinery that builds bacterial cell walls (see the Molecule of the Month on Penicillin binding proteins), which are quite different than the membranes surrounding our own cells. This gets trickier, however, when we need to fight parasitic animals, since their molecules are quite similar to ours. Many invertebrates, such as disease-causing parasitic worms, rely on glutamate-gated chloride channels, which are widely found in many types of nerves, including those controlling locomotion, feeding and sensing. The one shown here, from PDB entry 3rif , is an inhibitory channel from a roundworm. It is composed of five identical protein chains. The upper portion recognizes the neurotransmitter, glutamate, and opens up a channel that passes through the nerve membrane, allowing chloride ions to pass through. These channels are perfect targets for antibiotics, because our own cells don't use them. The 2015 Nobel Prize for Physiology or Medicine was awarded to two scientists who discovered drugs that block these channels. The drug ivermectin binds to the channel and locks it into an open state. As seen in the crystal structure, the drug binds between the protein subunits, within the membrane-spanning portion. Drugs like ivermectin have become the front line weapons for battling infections by parasitic worms, and are widely used to treat people and livestock. 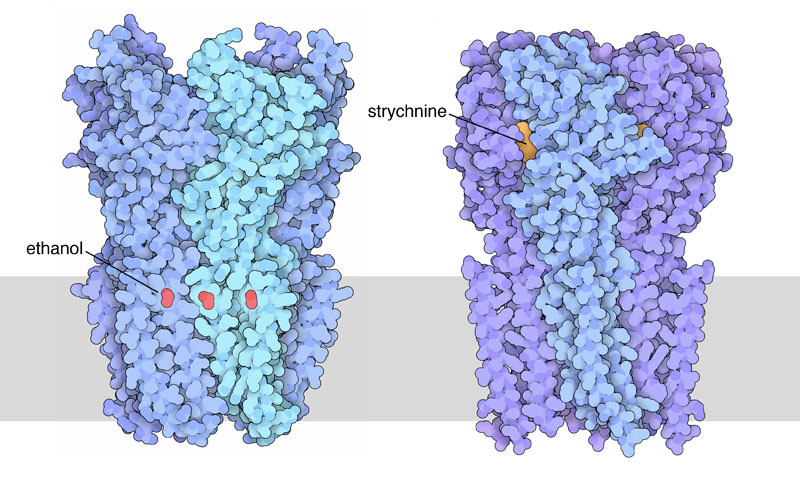 Bacterial ligand-gated channel with ethanol (left) and alpha-1 glycine receptor with strychnine (right). The nerve membrane is shown schematically in gray. Similar ligand-gated channels are used in our nervous system to deliver the varied signals needed for sensing, thought and response. Ivermectin does not bind strongly to them, but they are targets of many other familiar drugs and poisons. Two are shown here. Ethanol, such as that in alcoholic beverages, is seen in a complex with channel from bacteria, which is similar to our channels (PDB entry 4hfe ). Like ivermectin, it thought to modulate the opening and closing of the channel by binding between the membrane-spanning portion of the subunits. Strychnine, on the other hand, binds in the same site as the neurotransmitter, blocking the inhibitory signal and leading to uncontrolled nerve impulses and deadly muscle contractions (PDB entry 3jad ). Researchers have captured these channels in many states, revealing how they open and close in response to binding of their ligands. On the right is a closed channel (PDB entry 4tnv ). A leucine amino acid forms a tight ring at the center of the channel that blocks passage of ions. 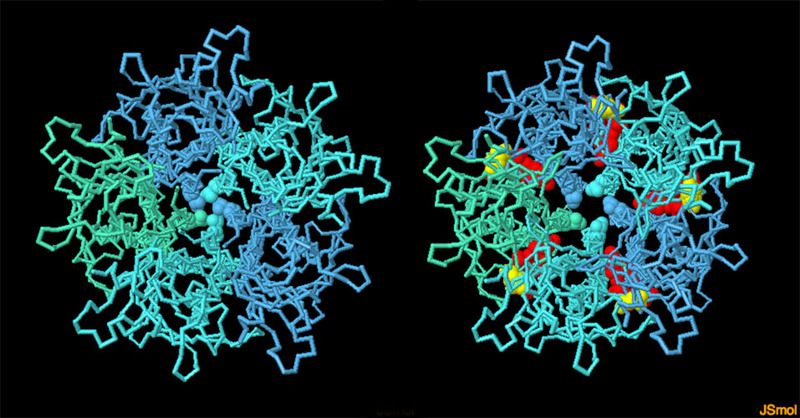 On the left is a channel with glutamate and ivermectin bound, which has opened the channel, allowing ions to pass (PDB entry 3rif ). To explore these structures in more detail, click on the image for an interactive JSmol. Structures for many similar channels are available in the PDB. Try searching for "Cys-loop receptor" to see a few examples. When you look at the PDB entries for glutamate-gated chloride channels, you'll find that they include five antibodies bound to the ligand-binding portion of the molecule. Why are these included in the structure? 3jad: J. Du, W. Lu, S. Wu, Y. Cheng & E. Gouaux (2015) Glycine receptor mechanism elucidated by electron cryo-microscopy. Nature 526, 224-229. 4tnv: T. Althoff, R. E. Hibbs, S. Banerjee & E. Gouaux (2014) X-ray structures of GluCl in apo states reveal a gating mechanism of Cys-loop receptors. Nature 512, 333-337. 4hfe: L. Sauguet, R. J. Howard, L. Malherbe, U. S. Lee, P. J. Corringer, R. A. Harris & M. Delarue (2013) Structural basis for potentiation by alcohols and anaesthetics in a ligand-gated ion channel. Nature Communications 4, 1697. A. J. Wolstenholme (2012) Glutamate-gated chloride channels. Journal of Biological Chemistry 287, 40232-40238. 3rif: R. E. Hibbs & E. Gouaux (2011) Principles of activation and permeation in an anion-selective Cys-loop receptor. Nature 474, 54-60. L. M. Fox (2006) Ivermectin: uses and impact 20 years on. Current Opinion in Infectious Diseases 19, 588-593.